In their study published in the journal Analytical Chemistry, researchers including Tetsuya Kitaguchi of Tokyo Institute of Technology’s Laboratory for Chemistry and Life Science showed that the sensors achieved up to a seven-fold increase in fluorescent brightness in response to glucose. 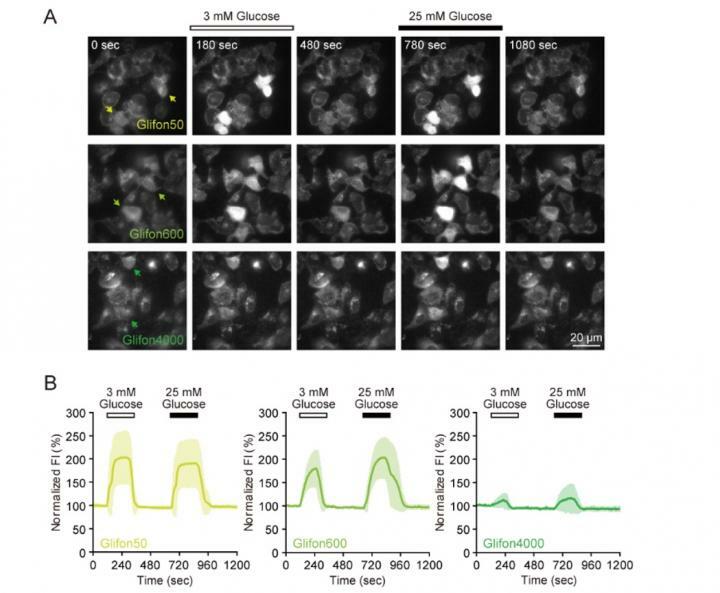 Based on their accumulated expertise in biosensor design and development, the team created three types of Glifons capable of visualizing a very useful range of glucose concentrations, from hundreds of micromolar to tens of millimolar concentrations. Named Green Glifon50, Green Glifon600 and Green Glifon4000, the three sensors have EC50 values  of 50 μM, 600 μM and 4,000 μM respectively. They then demonstrated that all three Glifons can be applied to visualize glucose in different parts of the cell such as the cytoplasm, nucleus and mitochondria of live HeLa cells . To verify whether Glifons are suitable for real-time live cell imaging, they conducted experiments using the roundworm Caenorhabditis elegans as an animal model. They succeeded in observing an increase in fluorescence intensity of Green Glifon4000 in the pharyngeal muscle positioned in the worm’s throat. The current study builds on Kitaguchi and his colleagues’ work on many kinds of biosensors, which they have colorfully named after birds and mythical beasts. “For sensors of second messengers, we decided to name after birds: Flamindo  and cGull . And for sensors of metabolism, we named after chimera: MaLion  and Glifon ,” explains Kitaguchi. EC50 values: Half maximal effective concentrations. Here, they refer to the concentration of glucose that induces a response halfway between zero and maximum. HeLa cells: One of the most commonly used human cell lines in biomedical research. The line was derived from cervical cancer cells taken from Henrietta Lacks, a patient who died of cancer in 1951. Flamindo: Fluorescent cAMP indicator. The target of this indicator is cyclic adenosine monophosphate (cAMP), a second messenger involved in many biological processes. cGull: cGMP visualizing fluorescent protein. The target of this indicator is cyclic guanosine monophosphate (cGMP), another important second messenger. MaLion: Monitoring ATP level intensity-based turn-on indicators. The target of MaLion is adenosine triphosphate (ATP), a key molecule that carries energy within cells. The indicator is named after Merlion, a mythical beast with a lion’s head and the body of a fish that is the official mascot of Singapore. Glifon: Green Glucose indicating fluorescent protein. These indicators are named after griffin, a mythical beast that is part lion and part eagle.